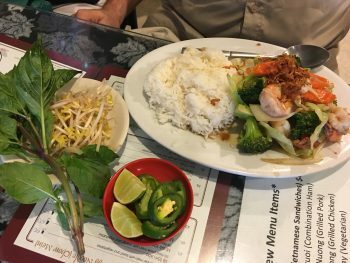 How I heard of this place: Among restaurants in Seattle’s pho-nomenon, our friends, living locally in the neighborhood, suggested we meet up here for dinner on a glorious summer evening. 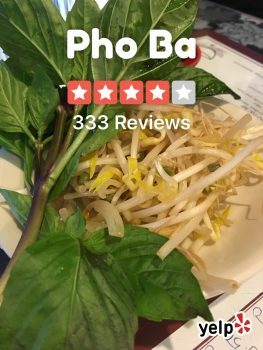 Type of cuisine: Vietnamese goodness throughout. 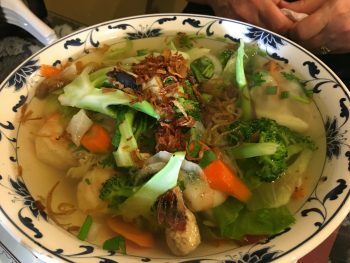 Come for your pho fix, enjoy something more, including fried rice, vermicelli or fried noodle, rice with vegetables and/or meats, Vietnamese crepes. Ambiance: A simple setting, the outside relatively unassuming from the sidewalk and situated next to a shop completely full of knick-knacks, the inside maintains its humble ambiance. Chairs and tables on either side of the long, rectangular dining area, a kitchen towards the dimmer back of house, the focus is truly on food, rather than setting. Employees seated at a circular table at the back, fanning themselves with paper, relaxed and chit-chatting as I entered, the first in the restaurant for the dinner hour. 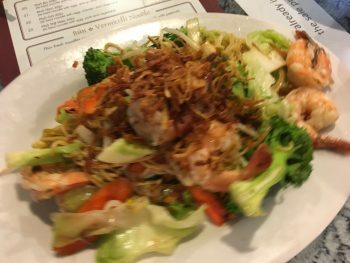 and a Fried Noodle ($6.50) with egg stir-fried shrimps and vegetable. What I loved: The food. All of it. 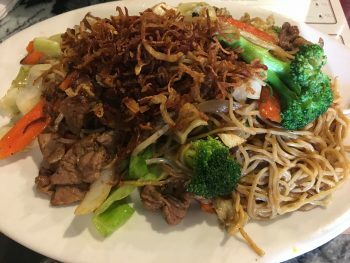 From the first bite to the last, the fresh, crisp vegetables and the perfectly seasoned, prepared shrimp, each taste topping the one before. Why I loved it: Excellent food at a more-than-reasonable price, satisfying portions and employees who leave you be to enjoy your meal and conversation created a perfect evening out.